Click connect, a pop-up will appear choose your FW version & change IP to your PS4 IP address then click "Inject Payload"
but when i clicked "Write| i got an error that says out of range. Those are for save modding, not memory modding. Those aren't for NetCheat, those are for BSD. Nope, these are codes for FFXV PS4 version. FFXV PS4 save codes. 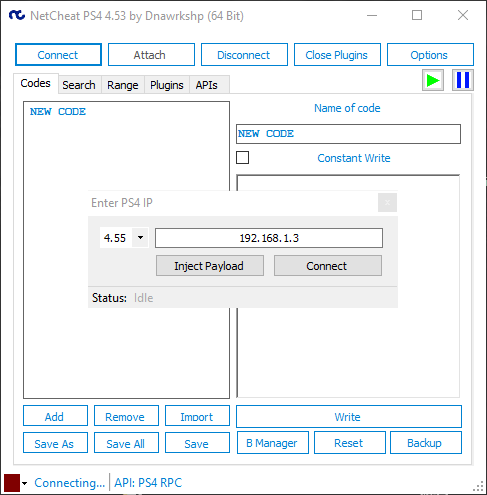 i used to add 0+space to "ps3" save codes and add then to NetCheat but it doesn't seem to work for the PS4. Maybe the D8A2612D might not have crashed, most games use the D0000000-E0000000 as the stack, but even then it might have messed up the stack and crashed too. I'm finding it nearly impossible to believe anybody could just put "0 " in front of a save data code and gotten it working on a PS3 game with NetCheat . You'd need to find the area of memory where it has the uncompressed save data, and then the offsets would have been different even though it would likely be workable with just a slight number change. That might explain your out of range error since I'm not sure netcheat can write to a place in memory that doesn't exist without triggering an error, but I don't know how it would have ever worked in the 1st place. I'm highly skeptical of throwing a zero in front and it just magically works, and I'm assuming the very 1st character of each line is likely a code type thing or something for the program that is used for messing with save data, and those code types are likely different than what netcheat has. You can't use save codes on memory on PS4 or PS3, save code ranges apply to the save itself which has nothing to do with real time memory. 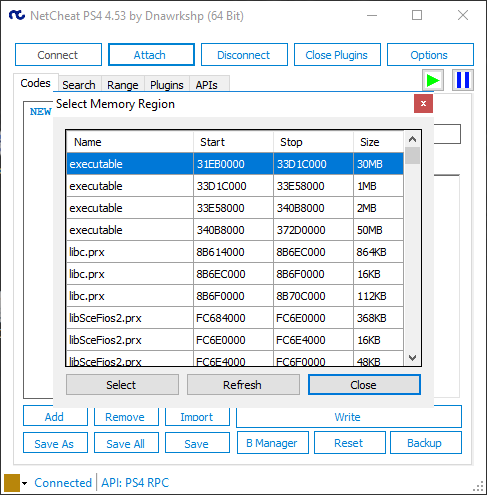 Those are PS4_Cheat files can be loaded and used, they use pointers mostly. I've seen this list before, but it doesn't work tried on two of the games listed (FFXV and Resident Evil 7 ) not one code nothing worked (i have the same game region) although i managed to find some codes for FFXV on my own, like money, XP for all party. Fire and Ice spells. They probably don't work because game developers are using dynamic memory allocation crap more often all of the time, and the codes in the list are likely all memory codes, and those memory addresses can change from simply restarting the PS4 or reloading a checkpoint or anything. Some games in that list can instantly be thrown in the garbage because you can't make memory codes of them, like Diablo 3 being impossible to make working memory codes of and can only really be done correctly with ASM code modifications like they were done on the PS3. You're likely stuff with the only current option being finding the codes with Netcheat or whatever else each time you play because the memory locations will be different each time, or wait until there's a debugger or something out where people can easily make ASM codes using memory codes. I know what you mean but have you ever heard of static pointers? Static pointer routes work fine as long as you can find reliable and correct paths that always work, but I've encountered some games having incorrect pointer paths for PS3 games, and even made 1 wrong bad code for Ni No Kuni Wrath Of The White Witch that ended up being a pointer path changing that broke my code. If you're able to find a working pointer path that's great, but good luck on choosing the correct few out of possibly thousands of bad results. Maybe you could try the pointer scanner with memory dumps in Cheat Engine since it's little endian byte order, but I've never had a reason to try it. I always prefer ASM over memory, because I can put the pointer path into the ASM code to separate the player from enemies/NPCs and make it work more reliably than just a normal memory code with pointer paths. Depending on how a game is coded, a simple thing like an infinite health code using pointer paths can still kill you from a 1 hit kill if the game has the zero health check immediately after it decreases health. If you put the pointer path into the ASM code and have it not decrease your health, then the zero health check will fail and you'd never die. any chance of having this to connect to PS3 as well? @GuitarMan What do you mean? You could just switch the API to CCAPI or TMAPI. Yes, I want to be able to choose which process to attach, is it possible for ccapi or tmapi? @Cain532 might be able to help because i'm sure he has done before on PS3.